How To Rename Multiple Files Instantly ? You may have faced the how-to-keep-the-fonts-intact-while-downloading-or-distributing-the-documents-in-ms-office/">problems and difficulties often to rename the files and folders. To come out of this trouble there is a tool available called RenameMaestro that is more powerful and reliable tool for making you orchestra-kitchenware-lets-you-eat-stress-free/">stress free. how-to-protect-my-files-from-copying-renaming-and-deleting/">Want to protect your files from renaming, copying and deleting ? This tool how-to-rename-the-recycle-bin/">lets you rename thousands of files and folders instantly. 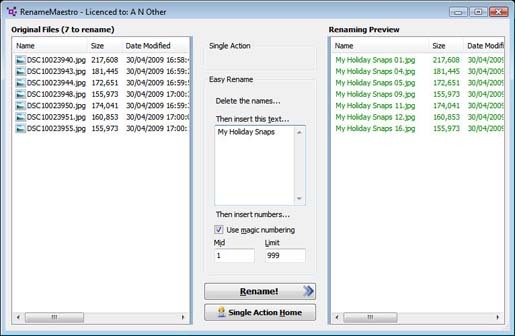 In this tool, existing file numbers are kept meaningful while renaming, find and replace with wildcards, supports the quick single action mode and the multiple action mode, drag-n-drop thousands of files to rename, how-to-read-pdf-files-in-gmail-without-pdf-reader/">save actions, one click preview option, can add date and time in your chosen format, allows adding increment and decrement numbers and letters, one click renaming and altering support, and many gladinet-cloud-desktop-lets-you-integrate-online-applications-with-local-desktop/">more features that makes this tool stand out of the crowd.